East Lothian prides itself on its rolling, rural countryside, dotted with farms and villages. 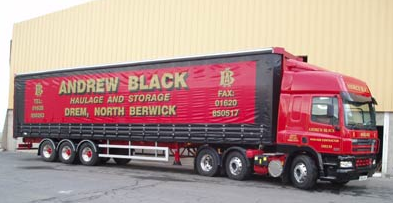 But, hidden away there are also some sizable businesses, like Andrew Black, the hauliers based at the old Drem airfield. This is a family business, based entirely in the tiny village of Drem. In fifty years, Andrew, together with his wife Janet and twin sons, has built the operation up to include thirty 44-tonne tractors and over fifty trailers of various sorts. Together with their rivals David Burns over in Bonnyrigg they have expanded with the growth in business but now face fuel bills of £400 for a round trip to Swindon and difficulty knowing how best to position themselves for the long term. North Midlothian SNP candidate Colin Beattie and I have both contacted our respective hauliers to say not just that we appreciate their difficulties and value the local work they bring but that we’ll fight on to bring tax relief on road fuel. The 5p/litre effective price drop announced in the budget is still not enough in the present economic climate when diesel has soared from 111p to 136p in barely a year. That’s a 22% hike or almost ten times inflation. That the oil-richest country in Europe need tolerate the highest fuel prices in Europe is inexcusable. In the long haul, the fuel tax regulator championed by the SNP is essential. This entry was posted in Commerce and tagged fuel price; haulage; budget. Bookmark the permalink.